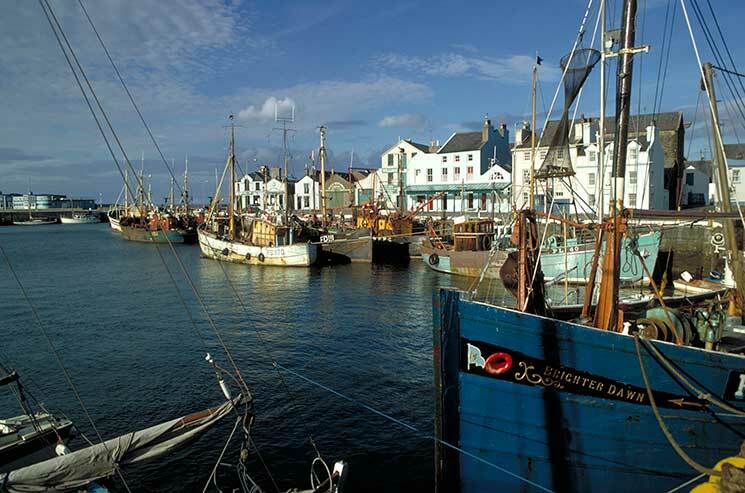 With 800 islands dotted around Britain’s coastline you could spend a lifetime exploring them. To get you started here are 10 of the best, where ancient history, abundant wildlife and dramatic 360-degree views come as part of the package. Any trip to Northumberland’s heritage coast should include a pilgrimage to the Holy Island of Lindisfarne. 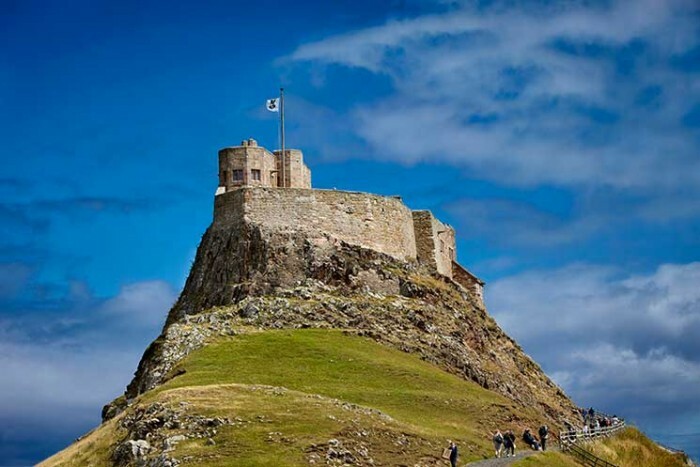 Only accessible at low tide via a causeway, the island is dominated by Lindisfarne Castle, an imposing 16th-century fortress that was built for Henry VIII. In 1901, architect Sir Edwin Lutyens was commissioned to create the Edwardian country house you see today. Nearby are the ruins of Lindisfarne Priory. Originally founded by St Aidan in AD635, this abandoned monastery provided a base for the monks as they set about converting pagan England to Christianity. Wander around the atmospheric ruins and visit the Heritage Centre where you’ll discover the story of Holy Island’s monks who lived here until the Dissolution of the Monasteries in the 1530s. Lying 28 miles west of Land’s End and accessible by helicopter, plane and ferry, the Isles of Scilly offer a different pace of life to the mainland, with white sand beaches, azure waters and a favourable climate. Of the 100 islands in the Scilly archipelago, only St Mary’s, Tresco, St Martins, St Agnes and Bryher are inhabited. While each island has its own charms, no trip to the Isles of Scilly is complete without a visit to Tresco Abbey Gardens, home to more than 5,000 sub-tropical and exotic plants brought to the island by Scillonian Master Mariners. The garden was laid on the site of a 10th-century Benedictine Abbey and includes the Valhalla maritime museum, where you will find carved figureheads and cannons rescued from local shipwrecks. With regular ferries from Portsmouth, Southampton and Lymington, the Isle of Wight is one of England’s most accessible islands, with around 2.6 million visitors every year. Major events on the island include The Isle of Wight Walking Festival in May and Cowes Week – a sailing regatta that has been running since 1826 – in August. But don’t let that put you off. 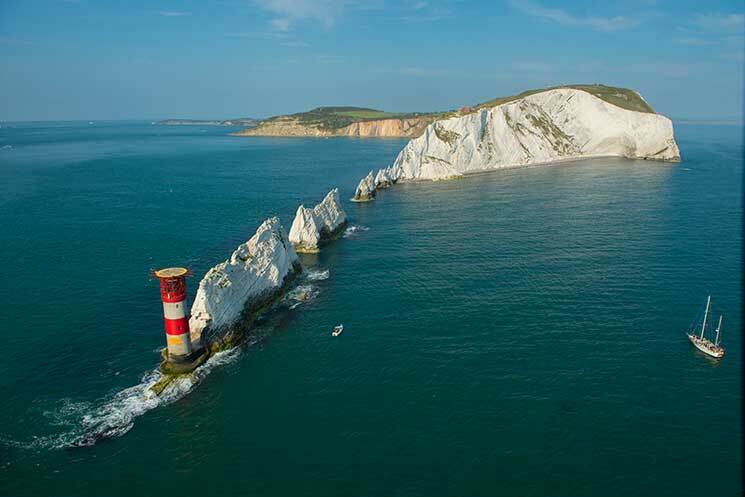 At 23 miles wide and 13 miles long, the Isle of Wight is big enough for everyone and around half the island has been designated an Area of Outstanding Natural Beauty, popular with ramblers and cyclists. Over the years the island has attracted many famous visitors, including Charles Darwin and Karl Marx. Queen Victoria was so smitten she established a country retreat at Osborne House, where she lived until her death in 1901 and where visitors can now book a stay in the Sovereign’s Gate ceremonial entrance. 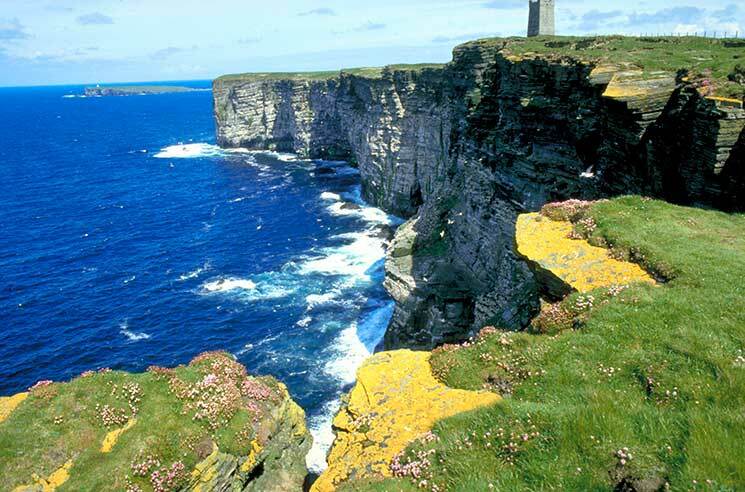 Rising above the northern tip of Scotland and just a short ferry ride from the terminals at Scrabster, Gills Bay and John O’Groats, the Orkney archipelago consists of 70 islands, pounded by the North Sea and the Atlantic Ocean. The largest of the islands is Mainland, famous for its Neolithic heartland. Highlights of this 5,500-year-old UNESCO World Heritage Site include the Ring of Brodgar, with its 27 standing stones; the tomb of Maeshowe, a chambered cairn; and Skara Brae, a well-preserved Neolithic stone village that predates the Egyptian pyramids. As one the last outposts of the Scandinavian dynasty to fall to the Scottish, Orkney is rich in Viking relics, including St Magnus Cathedral in Kirkwall. Built by Earl Rognavald in 1137, it continues to be used today. Three miles long and half-a-mile wide, Lundy is a small granite outcrop 11 miles west of the North Devon coast. Lundy offers the perfect escape from modern life with no cars or street lights, and only a shop, a Victorian church, a 13th-century castle and a pub to distract you from the island’s rugged charms. In 1986 Lundy was designated England’s first Marine Conservation Area, sealing its reputation as a haven for nature lovers, who come to spot the puffins, seals and basking sharks that patrol its shores. Just a short boat ride west of the Llyn Peninsula in North Wales, the tiny island of Bardsey has been a place of pilgrimage since the early years of Christianity. Although it is thought that the first monastery was built on the island by St Cadfan in the 6th century, the ruins you can see today are of the 13th-century Augustinian Abbey of St Mary’s, which was in use until 1537. In 1986 the island was declared a national nature reserve, recognised for its outstanding bird and marine life, with the possibility of glimpsing the cormorants, shags and curlews that nest here, as well as the Atlantic grey seals that bask on the island’s beaches. While day trips are limited to around 3 ½ hours, visitors who want to stay longer can choose from seven self-catering houses managed by the island’s trust. Located in the heart of the British Isles, the Isle of Man is perhaps best known for its annual adrenaline-charged TT motorbike road race. However, when the crowds disappear, the island takes on a more languid charm, with lush glens, rolling hills and deserted beaches to explore. The island is also famous for the Laxey Wheel as well as a host of marine life, with opportunities to spot grey seals, bottlenose dolphins and minke whales and some of the best diving in Europe thanks to the numerous shipwrecks along its shores. For an insight into the Isle of Man’s history, take time to visit the Manx and House of Manannan museums, where you can find relics of the island’s Celtic, Viking and maritime heritage, as well as the story of the ancient Tynwald parliament, which still governs the island’s affairs. Rising dramatically from the Firth of Clyde, between Ayrshire and Kintyre, the Isle of Arran is one of Scotland’s most southerly islands, linked to the mainland by daily ferries from Ardrossan. Often described as ‘Scotland in miniature’ the island has a diverse landscape for its size (19 miles long by 10 miles wide), with mountains and Lochs in the north, rolling hills and woods in the south and pretty villages peppered along its bays. With a history steeped in myth and legend, the island has a number of ancient sites, including the Machrie Moor Standing Stones and St Molio’s Cave with its mysterious wall carvings in a rare Pictish script. Head east to see Brodick Castle, an imposing fortress with over 600 years of history and unforgettable views over Brodick Bay to Ayrshire. Curving in an arch along the west coast of Scotland, the Isle of Skye or ‘misty isle’ is the largest and most northerly island in the Inner Hebrides, with a proud Gaelic heritage. At the centre of the island, the Cuillin Mountains have long been a favourite with walkers and climbers, while wildlife lovers come to admire the island’s sea eagles and red deer. 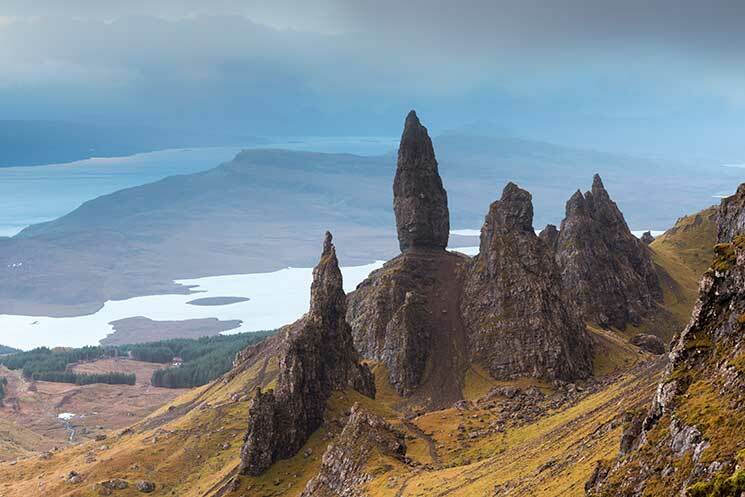 Inhabited since prehistoric times, Skye is rich in history, with stone circles and castles dotted across the landscape. For an insight into the clans who once ruled the island, make time to pay a visit to the Clan Donald Visitor Centre in Armadale, where anyone with a Macdonald in their family tree can trace their ancestry at the genealogy centre. If you’ve got time for a wee dram, pop into the Talisker distillery to sample the celebrated single-malt whisky. If you’re serious about getting away from it all, few places offer the isolated splendour of Unst. Located at the extreme northern tip of the British Isles, in the heart of ancient Viking seaways, this was one of the first stops for Nordic marauders on their way to Britain and the island is rich in Viking remains, including the 30 longhouse sites that have been discovered to date. For the ultimate Viking experience, don’t miss the annual Up-Helly-Aa Viking Festival in February. Before you leave, a visit to the Hermaness Nature Reserve is also a must, with thousands of nesting puffins, gannets and the rare great skua (known locally as Skooies).